Here’s to celebrating 50 pages of JOHNSON & SIR! So who do you think would win? Leave your vote in the comments below! P.S. Would you like me to make this a print to hang on your wall? That’s quite the match up. The shark would likely have the upper hand if he can get the T-Rex into the water. 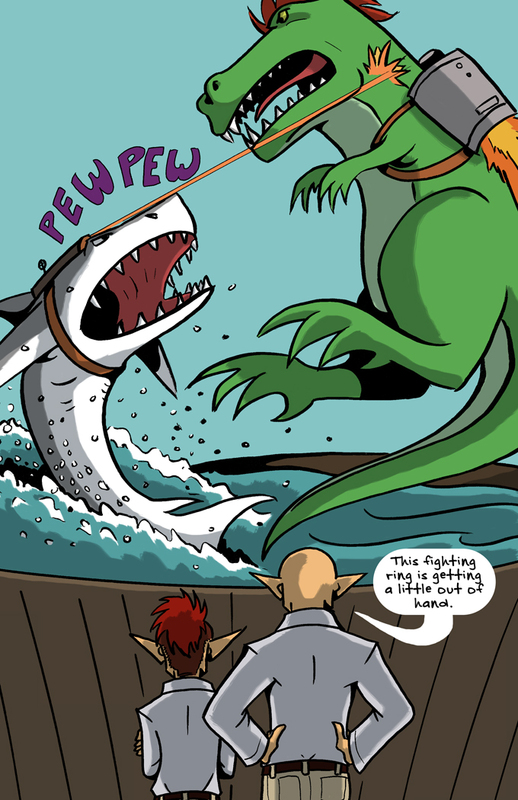 Of course, the shark having lasers gives him an unfair advantage. I’m thinking that, since the fight is taking place in a pool, that the T-Rex would have the advantage. If the fight were in the ocean, I bet the shark would win eventually.